The Interfit Super Cool-lite 6 2 Light Kit is an ideal choice for portrait photographers, videographers or anyone desiring a soft, flattering light source. At the heart of the kit are the 2 Super Cool-lite continuous light heads. Each head accepts six 32W fluorescent lamps (included) which are individually controlled from push buttons on the rear of the head. You can vary the output and intensity by simply switching on or off any of the lamps. With all lamps on, the output is equivalent to approximately 650W of tungsten light. Digital photography reacts especially well to fluorescent sources and depending on how many lamps are illuminated your color temperature will run from 4800 - 5200K; all considered daylight balanced. You won't have to worry about mixing light sources when used in rooms or studios with high natural ambient light. The Super Cool-lite 6 is constructed of durable polycarbonate material and integrates an ergonomic handle and tilting mount which accepts light stands up to 5/8". 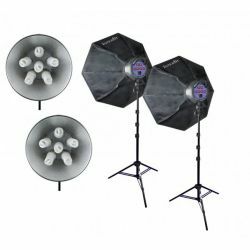 Included with the kit are 2 16" (40 cm) high-intensity reflectors which can be used alone with the head for extra punch or when you want a sharp-shadowed look. If you don't, the 31" (80 cm) Octoboxes will give you the opposite effect. The octagonal shape has a very large surface area, making it perfect for head-and-shoulder or full-length portraiture. The closer you pull it to the subject, the more you'll notice the soft wrap-around quality of light that this type of box if famous for. 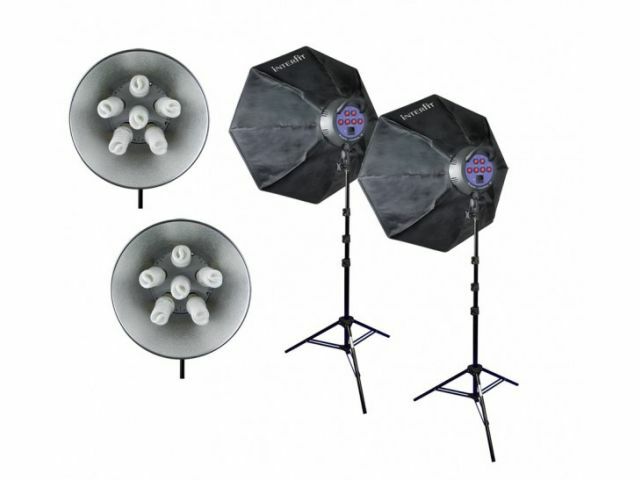 Finally, the kit is rounded out by 2 sturdy 10.5' (3.2 m) air-cushioned light stands. The Octobox is 80 cm (31") is ideal for portraits, providing a soft and uniform light source which is perfect where skin tones are the major content of the image. The six fluorescent lamps are individually controlled for maximum flexibility.